THERE’S a picture hanging in the Ballinrobe Racecourse photo gallery. 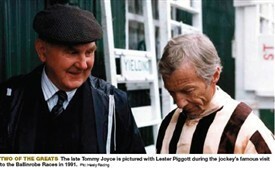 It shows the late Tommy Joyce, who worked at the course for 35 years, alongside Lester Piggott on the jockey’s 1991 visit to the Mayo track. “My dad was the track manager at the time, and he happened to be in the right spot at the right time when there was a cameraman around,” Michael Joyce, now a member of the Racecourse committee, told TheMayo News. When the races were over, Joyce would help fill the holes in the track – using a donkey and cart. “It was all manual,” he recalled. “You’d put up a sieve and you’d throw the clay against it. The stones would come away and you’d keep the fine clay.” Nowadays, a “great team” – track foreman Tony Walsh, John ‘Deora’ Donnelly and Noel O’Malley – look after that end of things with “a big tractor and electric sieve”. Portable fences have changed what’s possible too – “They’ve improved things no end up there on the track,” he explained. Race meetings in Ballinrobe were less frequent than now, though Corpus Christi meant Mass and a procession in the morning and horses in the afternoon. The possibility of closure was raised at one point, and Joyce says the late Jimmy Tierney was “a major mainstay” in keeping Ballinrobe open, along with Barney Daly. Since then, it has gone “from strength to strength”. Lester Piggott’s victory in 1991 was a highlight. Rite of Passage won at Ballinrobe in September 2009 before victories in Punchestown, Leopardstown and Royal Ascot. Dermot Weld “used to always send” Ansar to Ballinrobe for schooling before Galway, where he won a Plate and a Hurdle. This page was added by Averil Staunton on 11/08/2011.